Crude oil got crushed yesterday. Just when you thought it was safe to look at WTI prices hitting a four-year high, the geopolitical monster in the Middle East reared its ugly head. And just when you thought the oil bulls were finally back in the driver’s seat, the bears wrestled away control. Yeah, it’s been that kind of October so far. The story behind the death of journalist Jamal Khashoggi seems to be changing by the day, and it’s put the Saudi royal family squarely on the defensive. First he disappeared and the Saudis insisted that he had left the consulate. When the Turkish police came out and said he was killed inside the consulate, it was clearly done by rogue elements within the kingdom. No, wait... he died after starting a fistfight, but it doesn’t matter because the Crown Prince had no idea what was going on. Pay no attention to the videos being passed around the media right now or even the recently surfaced footage of a Khashoggi body double. Now, these lies are straining the one of the Saudis' most powerful relationships, as President Trump went on the attack yesterday, saying he felt “betrayed” by the Saudis. The heat is on the Saudi Kingdom. What could possibly go wrong? The Saudis are banking their PR strategy over Khashoggi’s death on one thing: You need us. And here’s the bitter truth of the matter: They may be right. Look, we’ve been talking about the looming sanctions on Iran’s oil exports for the better part of 2018. 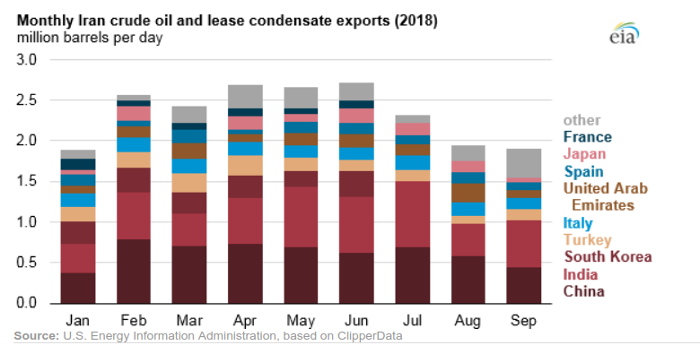 Exports out of Iran peaked at 2.7 million barrels per day last June, with over half of that oil going to China and India. Let’s just assume China will pay no heed to sanctions being levied against Iranian oil exports. After all, it just means they’ll be taking advantage of Iran’s desperation and get a sharp discount on that oil. India, however, is a different story. It’s expected to at least partially comply with Trump’s sanctions. Now couple this loss of Iranian oil on the global market with the collapsing production we’re seeing in Venezuela (as well as other failing OPEC members like Angola). Things could still get very, very ugly. Currently, the Saudis are extracting roughly 10.7 million barrels per day. That, according to the kingdom’s Energy Minister, could rise by another 2 million barrels per day if necessary. Of course, he also made a note that spare capacity elsewhere could be a problem. Here in the U.S., crude oil output stands just north of 11 million barrels per day, and the EIA only expects production to average 11.8 million barrels per day next year. I’m not entirely sure the herd understands the sheer volume of oil the world consumes on a daily basis. So far in 2018, we’ve burned through nearly 30 billion barrels of crude. That’s not a projection that will be revised later down the road. More than 98 million barrels of black gold are fueling the planet every single day. And that number is going to swell going forward. When the demand scales tip past the psychological benchmark of 100 million barrels per day, maybe more people will sit up and take notice. And for anyone waiting for a full-blown confession from the Saudis over Khashoggi’s death, I have some bad news for you. It also begs the question of whether or not you should take the Saudis at their word regarding any production increases. Some analysts have reported that it could take almost a year for the Saudis to boost output by one million barrels per day. Let’s see the short-term volatility taking its toll on oil prices for what it really is: opportunity! The fundamentals are still on our side, and right now, it’s a stock picker’s dream market.